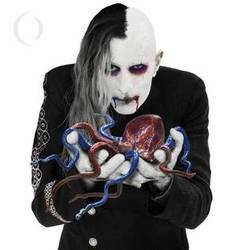 Regardless of which band Maynard James Keenan is recording, promoting or touring with - he is usually the one unfairly maligned for holding up the proceedings, but make no mistake...A Perfect Circle is the brainchild of guitarist Billy Howerdel. And until he was ready to record again (in this case, 14 years after the band’s previous effort, Emotive) - it just wasn’t gonna happen. So here, in 2018 we finally have a new APC album, Eat the Elephant and what’s on everyone’s mind is whether or not it was worth the wait. Well the answer, in short, is yes. Sort of. Eat the Elephant isn’t what one would typically expect from a band after a 14 year absence. Usually after that much time has passed, the result is a mere facsimile. A shadow of what once once. Luckily for us, A Perfect Circle casts a long shadow and is able to span such a time as to make it feel like only a year or two has passed. Ok, this maybe isn’t evident in the album’s first and title track, but look beyond the piano heavy syncopation, and the APC groove starts to glow. Then, as “Disillusioned” strikes its first chords, the memories come flooding back. And this is really both the album’s strength and it’s weakness. Because while the band has appeared not to have changed to any significant degree, the band’s loyal fanbase almost certainly has and it will be interesting to see just how much the new old sound is embraced. The one exception, the one anomaly, the one track that stands out like a sore thumb on an otherwise welcome return is “So Long and Thanks For All The Fish”. It’s hard to rectify an almost anthemic-sounding major-key tune with the catalog of a band known for almost dirge-like introspection. In comparison to the other songs on the album, it sounds like it belongs on a commercial for the olympics. Another curious inclusion is that of "By and Down By the River" - a reworking of "By and Down" - a song included in special editions of the band’s Three-Sixty compilation. The original version is indeed the stronger of the two with its slower, more immediate arrangement. Look, Eat the Elephant is not going to appease the masses. There’s going to be some folks disappointed in the end result but I think those people really need to ask themselves what they were let down by more - the album, or their own expectations. Posted Oct. 29, 2018, 7:20 p.m.
Posted March 9, 2018, 10:03 p.m.
Posted Dec. 26, 2013, 7:02 p.m.
Posted Oct. 27, 2013, 5:17 p.m.